Spawns upon the death of Radir Fireshower. This page last modified 2018-08-19 04:38:29. I believe this mob and Spirit of Tawro can be done solo by a good high level bard. I have seen Spirit of Tawro atleast be killed this way. So, I think that Spirit of Radir can be done solo also. You can invis most of the way up to each of the mobs and kill the few see invis that you might run accross. Then pull the named to the zoneline or where ever. I used my 65 bard and killed Spirit of Tawro with two level 65 Shaman with pets which was a 10 or 15 minute fight. Solo'd today on my bard. Invis'd to Radir then pulled with proximity agro. Once out of the cave, pulled him far enough away from adds & faded. (Yes, he still runs faster than the others.) Pulled him by a group of gantrus, charmed one, slowed Radir, sent pet in, and chanted him down using everything but fire with 4.2 drum mod + crit affliction 1. I stacked 4 226/tick dots, which came out to about 106 dps after factoring in resists which were quite a bit. I faded every time charm broke to reset agro on the pet. Took two pets to kill him. With nearly 7k mana & ft22, I used ALL my mana so be careful if you use that strategy. With all defensive AA's, he hit for 325 max & often missed several rounds in a row. You could probably just kite him if you're a well-geared/AA'd. And he dropped Bracer of Might, Darkblood Sword, & Shadow Heart. Was probably about 10 min fight. I didnt know bards needed mana?? Both 65 with tons of AA. Just chain healed whichever pet had aggro and dotted when one of us scored a crit heal. Fight lasted 10 min or so. Altis Asmodey "Mortalis", Bored Exarch of Venril Sathir. Killed today with 1 group: 65 shammy, 57 beastlord, 56 shadow knight, 56 druid, 56 cleric and 53 ranger(me) took a long time to die and adds started re-popping, but we kept them rooted and got the pets on them. Dropped bracelet of might and 2 darkblood swords. My advice is keep him slowed, that's all that really matters. (which was 12 levels ago when I was hunting Elysian armor and got ganked by him after a failed raid). Killed today with 8. Level range 52? to 62. Chanters were 61 and 56?. First we went into the caves to kill him. We invised through most of the rooms. We had to stop and kill a couple of see-invis mobs (the Fire Caller and the Fire Warder), and a non-see-invis Guardian roamer. Genius me (first time there) goes to take a look at Fireshower and gets too close and aggros the whole room. Chanters are so busy doing a great job of keeping all the Guardians mezzed, they forget to reslow Fireshower. When slow wears off, Pally dies in short order, everyone else follows. All of the repops were Guardians and did not see invis, so me and the cleric sneaked back in to room where everyone had died and began rezzing. Roamers came by and killed us again, as everyone was oom, so not enough heals, no slows, no mezzes, although we tried. We were going to give up when it occurred to me that all the mobs up to Radir's room did not see invis (since we had killed the ones that did, and Guardians repopped in their place). Also, someone had pulled Fireshower to the cave entrance, and I figured he was still standing there and he would be an easy pull, and I would only have to worry about pulling Spirit. Fireshower had actually returned to the cave, however. So, after we were all CR'd, rezzed, and at zone, I went back and invis'd (10 min, fixed-duration invis) all the way to Radir's room. I Harmony of Nature'd any mobs other than Fireshower that I could see, then (still invis) I edged up toward the room until Radir aggro'd. He has a HUGE aggro range, so I had plenty of time to run back w/o being hit. Fireshower runs a little faster than your average alien, and Spirit runs SIGNIFICANTLY faster than the other mobs there (same speed as a Dark Assassin). So, still invis, I would run through each room and tunnel on the way out and turn around at the end of each one to make sure Radir was close enough not to get stuck. The mobs wouldn't aggro me until Radir ran by them. So, I get out of the cave, finally, with every alien on my tail and Fireshower leading them. By the time I kited him to the druid elbow, with 40% plane clip, I couldn't even see a single alien behind him, as he had outrun them all (I guess?). I tell the Pally to wait just outside the tunnel from the ME zoneline. I had to quickly Harmony of Nature a Gantru Shojen that was standing at the top of the hill by the ME zoneline tunnel entrance. I run by the tunnel, and I start Egress just as Fireshower tops the hill. It worked out perfectly, because I zoned right as Fireshower ran past the Pally. I never even took a hit. Pally got aggro and kited Fireshower inside the tunnel. Dead Fireshower. Spirit went down pretty much the same way, except I had to lead him a lot more, because he runs so fast. He also picked up a Dark Assassin add on the way in (which is how I happen to know that DAs run at the same speed), so I ran past the tunnel a bit and Egressed. Spirit camps for hours after being pulled sometimes, so I knew that the DA would leave first. If he didn't, I could just run them along and Egress again (hehe, Druid splitting). The DA left and I range-aggro'd Radir again and ran him into the tunnel to the ME zone. Pally cast on him, and I Egressed again just in case. Didn't take a hit that time either. The battle took a while, but in the end, Spirit of Radir bit the dust. Got a nice pic of his rotting carcass. Drops were Bracelet of Quickness, Pebble Crusher, and Knotted Knuckles. Thanks to Ren for helping us out. Thanks to Mugs for staying past his bedtime. Thanks to GoK for doing a great job and bearing with me through my mistakes. Radir or his spirit no longer run faster then the other cave mobs. This used to be a classic monk pulling strategy where the monk ran invis all the way to Radir, bring him and 30 other mob out of the cave, FD and have the tank peel Radir. It no longer works this way as Radir and his spirit run slightly slower then the rest of the mob now and you'll either get agroed by the regular mob or lose Radir running out. Can anyone confirm that he Drops wand of cursed souls? I have killed this mob at least 50 times now an have never seen one drop. I have only seen one Pebble Crusher drop in this whole time but i find it hard to believe that a wand wouldnt drop in all the times ive killed him if it is on his loot table. 61 Cleric, 61 Shadowknight, 62 Shaman, 52 Shadowknight, 61 Monk. Getting to Radir is very easy, invis past all the non-see invis mobs (guardians) in the cave and kill the see invis ones (fire callers) our 61 Monk had no problem doing this. There should be at least one pather going up and down the cave so watch out for him. Other then that its a straight walk down to Radir. Mobs in the cave dont really cast anything serious, and they dont run. Radir himself has very large aggro and there are other mobs in his room. We messed up and pulled him first try (very very large aggro) to split along with another mob so we decided it would be safer to clear room before killing Radir so the Monk pulled while the 61 SK tanked Radir *AND* all the pulls for about 10-15 minutes. That is an example of how gimp Radir is. I dont remember him flurrying but the Spirit did it was barely noticeable. I was the Cleric and had no mana regen besides BAotR self buff and FT2 never ran out of mana. I've killed him a number of times with guild. Somebody runs a tracker to UP, checks on tawro and radir. If both are up they ask for 1-2 groups to arrive at UP zone in ASAP (I usually COH anyone who needs a call). If possible we invis right through to tawro, usually theres 3 see invis mobs along the way but its not too bad, we take out tawro, spirit pops, med up. Tank and a healer run in for aggro, tank will call for the raid to charge... sick pet, malosini, and nuke away. Same goes for radir but we fight in to his lair... altogether between the 2 it takes about 90 minutes (if we have someone to succor me to zone so i can call groups to radir's cave) to about 2 hours if we don't. I've seen all drops from radir but the int bracelet, currently using pebble crusher. 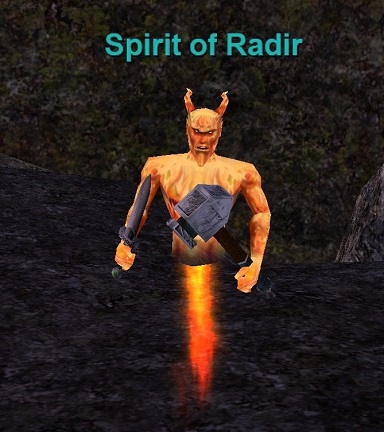 Dropped Radir and his spirit on 7/4/03. 1 Group: 63 SK tanking, 59 pal, 64 cleric, 56 enc, 60 and 58 druids. SK pulled radir out to elysian corner, landed slow easy enough and took him down. Druids had trouble landing nukes, so helped CH. No loot, maybe 5 minute fight. Spirit of Radir came next, pulled to same spot. Very long fight, maybe 10-15 minutes. Druids began chaining exile summoned which landed for 705. Dropped Darkblood sword, mithril edged short shord, and bracelet of quickness. We killed him today with me dualing 62 pally and 62 monk, 63 cleric, 60 druid, 60 necro, 58 bard, 58 shaman. I pulled him out of the cave with monk and FD'd him at the exit while I peeled with pally and brought him to the group. Monk had to /q to clear agro of the 20 or so mob she dragged along so she didn't participate in most of the two fights. However, once slowed it was just a matter of time and probably could have done with fewer as easily. The following day he dropped two Darkblood Swords and a Bracelet of Quickness. Yes, I know it's not listed here, but he dropped it. We had almost the same group composition, except no cleric this time. Bard won the bracelet, and two alt SK's looted the swords. My pally had better so I let them have it. I have a question about where this guy appears, when going in is he straight ahead (along the long path) or in the shorter left turning path that goes to an open chamber? He's straight ahead all the way down. You'll see a nice, red, oval rainbow thingy at his spawn point which DOES look like a portal as mentioned below (ignore the rock comments; obviously they've never been inside the cave). Had no problems slowing after malo. No tash or occlusion. 65 hunter,65 chanter,63 cleric took it down today,very easy.But took us long time,because not enough DPS,so the cleric has to join for melee,lol. After Radiz is killed, this guy spawns inside the room. so if you pull radiz and his guards out to the next room, you have time to med/rebuff before taking on this ****. We took him down just moments ago. He was actually Dual Wielding two Shadow Hearts. In retrospect I should have taken screenshots. One went to me, one went to a rogue. We one grouped him and the only other person that could equip it was a SHD and he had one. He also dropped the Bracer of Sense, and a Rune for the new research. Sorry I can't remember levels. It was close, the SHD was an Ogre, they make great tanks. We had problems getting him slowed because he resisted (our enchanter was 64 btw) and it didn't stick until myself, the bard, smacked him with OoS. a small group consisting of a 50 and 65 ranger, 55 shammy (and pet), 54 warrior and 55 cleric took out Radir and his spirit on 03/22/03. We logged 48k melee damage to Radir and 74k melee damage to Spirit. Spirit dropped one bracer, 2h sword, and one rod listed in its known loot. We came in here with 10 guys to take him out. All 45-61. When he popped he was dual wielding Mithril Edged Short Swords. Needless to say, thank God we had a shaman with us. And anyone who says that this guy is only the fire version of Tawro is out of their mind. This guy is insane compared to him. Just Curious as many of you may have noticed there is a portal rigth behind him anyone know where it takes you and or a link to the quest for the key? ROFL, ya I think it's a rock too. LoL, you guys are kidding right? He's not talking about the lame Photograph. He's talking about the actual place where you kill this guy. Obviously this fellow has actually been there and killed this guy. There is a Giant portal in the center of the room. This giant portal, that dominates the view of the room that Radir spawns in, is what this guy was talking about. Sorry if I sound like I'm flaming. I couldn't believe it when I saw your replies. I hope this clears things up for folks who haven't been on a trip to Kill Radir. Yeah, like Radir Portal Now that's a big rock, hehe.